Recently I was given the opportunity to preview an upcoming new game that will soon be available to back on Kickstarter. I received a prototype copy of the game and rules. These are my thoughts and opinions on the presented materials. Enjoy! 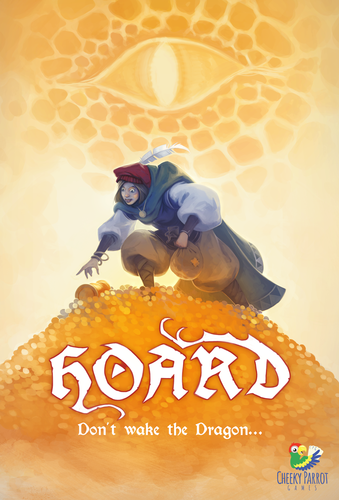 Hoard is a game by Tim Kings-Lynne, Beck Veitch and Julia Schiller, published by Cheeky Parrot Games. It is for 2-5 players. In this game, players are treasure seekers who’ve discovered a sleeping dragon’s treasure hoard. They will be trying to secure as much treasure as possible while fending off the other players and keeping the dragon asleep. The player that can best manage this will be declared the winner. To begin, the three dragon cards should be placed in the middle of the play area and arranged to show the dragon fully asleep using the blue side of the cards. All the game cards are shuffled together. The top twelve cards of the deck are arranged around the 3 sleeping dragon cards to form a 5 x 3 grid. The remaining cards are placed facedown in a stack within reach of all players. Each player draws a starting hand of 5 cards. They also select a colored pawn which is placed on one of the 12 facedown cards that were placed around the dragon earlier. Each player is then able to peek at the card beneath their pawn. Once everyone has completed the task, play now begins. The game is played over several rounds. On a player’s turn, they may perform one of four different actions; roll and move, secure treasure, use a dragon action card or use a sword or shield card. The first action that can be taken is to roll and move. To do this, the player rolls the die and moves their pawn the number rolled either clockwise or counter clockwise. If the symbol is rolled, the player may stay where they are or they may announce a number between 1 and 5 and move that number of spaces. The player then secretly looks at the card they landed on. The player can then keep it and draw a new card to replace it with or they may replace the card with a card from their hand. If a new card is drawn, the player may look at it before placing it face down. If they choose not to keep the card, they may place it back face down and draw a card from the deck. The next action that a player may take is to secure treasure. To do this the player may place a set of cards from their hand face up in front of themself, in their scoring area. At least three matching treasure cards must be placed to begin a set. Double item cards count as two cards. The player may later extend a set using at least two matching cards of the same color or one double card. A shield card may be laid down to accompany a sword card that was played on a prior turn to attack an opponent successfully. The shield card can also be played to take an opponents unpaired sword. Both cards are then placed in the player’s scoring area. Treasure chest cards are wild cards that can be used in place of any of the colored treasure cards. However, only one treasure chest may be played at a time and they cause a dragon card to be flipped over to it’s red awake side. Another action that a player may take is to use a dragon action card. To do this the player simply places one of the dragon action cards in front of themself. A bones card will wake the dragon causing one of the dragon cards to be flipped over to the red awake side. The first time that the dragon is awakened the player flips over the tail section. The second time the body section is flipped and the last time the head is flipped over, ending the round. A Shhhh! card will cause the reverse effect, putting the dragon back to sleep. This is done by flipping the red dragon awake card back to it’s sleeping blue side. The choice card allows the player to choose between either the bones or shhh! side. The player simply announce which side they wish to use and place it face up in front of themself. Only one dragon action card may be played on a turn. The last action that a player may choose to take is to use a sword or shield card. To do this the player simply places a sword card in front of them and names the opponent that they wish to attack. If that player has a shield card, they may place it in front of themself and take the attacker’s sword card, thereby blocking the attack and scoring points for themself. If the defender, does not have a shield card, the attacker may do one of three things. They may look at their opponent’s hand and take one of their cards from them, they may give them one of the cards from their hand or they may take a card from their opponent’s hand and give them one of their’s in exchange. The sword card remains in front of the attacker for any successful attacks. Once a player has taken an action, play passes to the next player in turn order. The round continues from player to player until one of the round ending events take place. If the third dragon card is flipped over to it’s red awake side the round ends. It can also end if the last card is drawn from the deck. The other way the round can end is if a player ends their turn with no cards in their hand. In this case, each of the player’s opponents are allowed to take one final turn. One of the player’s opponents can use a sword card to give the player a card, thus delaying the round’s end. Of course that’s if an opponent has a sword card to use. Players may also try to fully wake the dragon causing the round to end immediately and not allowing any other players to have their last turn. Once the round ends, scoring takes place. Scoring a round is done by counting up the points scored by each player. Players receive 1 point for each treasure card that was secured. Double cards count as 2 points. A sword and shield that are paired together count as 1 point. If a player played only 3 dragon action cards, they score 5 points for the set of 3. Players lose 1 point for each treasure card left in their hand. They lose 2 points for double cards. Treasure chests count as 1 point if secured but do not count against a player that has one left in their hand. Swords, shields and dragon action cards don’t count against a player either. Players then compare their scores and the player with the most points receives a 2 point scoring token. The second place player receives a 1 point scoring token. A new round is then setup and play continues. All this continues until a player has at least 5 points in tokens at the end of scoring. The player that does this first, is the winner. Since this was a prototype, the components aren’t finished. Therefore I won’t go into a lot of detail. What I will say is that most of the game consists of cards. Each of the different card designs look really nice. 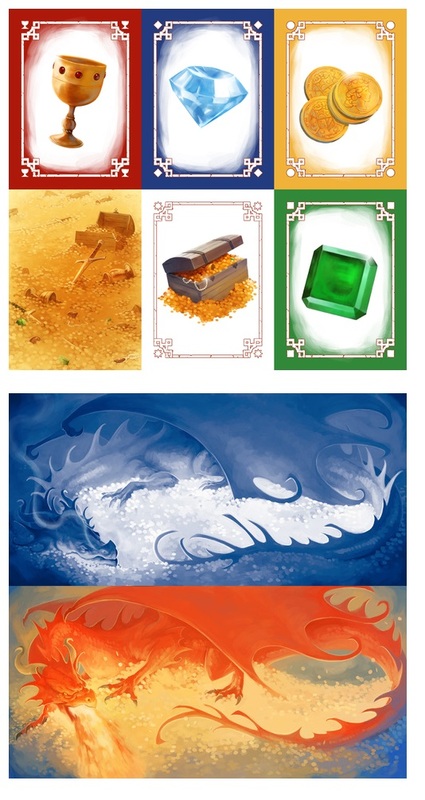 There is a really thematic approach to the look and feel, from the double sided dragon cards to the treasure cards. There’s really some great looking art for each one. I really like how that when the game is setup, it looks like a giant sleeping dragon on top of it’s hoard of golden treasure. It made me think of Smaug from the Hobbit. In the prototype the player pawns were different colored meeples, however I’m sure this will most likely change before the final draft. The game does come with a custom six sided die that has a unique looking symbol in place of the number 6. If you read the rules above you understand how this works out. In any event, the game really looks to be headed in the right direction. I think the finished product will only improve on a really great looking design. The rulebook is also a prototype copy. It’s very close to completed though so I can give you a fairly good idea of what to expect. First off it’s not very large. There are only a few pages so it doesn’t take long to read. It has several pictures but no real examples to speak of. Everything is really easy to read and understand. The rules are all laid out in an orderly fashion with each of the different actions explained thoroughly. With the smallness of the book, there’s not really a lot to it. That said, it looks nice and takes care of everything you need to know so that you can play the game. This is a really light, fast and fun card game. It doesn’t take a lot of thinking or strategizing. It’s mainly about set collection. Of course there are a few more things to consider than just that. I played this one with my 6 year old daughter and she really enjoyed it. She enjoyed collecting the different treasures and moving around the board. She kept telling me to be quiet cause we didn’t want to wake the dragon. Of course by the third play through of the game, she was doing everything she could to wake that old dragon up. Needless to say, she’s pretty darn good at the game. I enjoyed the many different actions that were available. A lot of times everything seemed pretty well cut and dry. I’ve got 3 cards of one color, time to lay down and score some points. Other times it was a bit more challenging. Do I move to a card that I already know I could use or do I try to find something else and come back to the one that I already know. Lot of choices and lots of interactivity to be had with this game. It’s a fairly quick game too, with most rounds lasting about 10 minutes. The number of players per game and how everyone plays will affect the full play time. Either way, the game is a light fun game that is great for families. Fans of games like The Butterfly Garden and Bohnanza should really enjoy this one. It’s kid tested and father approved. Hoard is a light weight card game of set collection and memory. The game time varies but each round takes about 10 minutes each. The art style and look of the game is really fun and thematic even in the prototype. The game is simple enough that younger players can enjoy the game as well as adults. It’s a great family game that will appeal to all players. There’s plenty of player interaction with only a little bit of strategy thrown in. My daughter and I both enjoyed the game and found it to be very entertaining. Fans of set collecting games like The Butterfly Garden and Bohnanza should enjoy this one as well. I would highly recommend this game especially to families. I look forward to the finished product. Looks to me like this is one game that is a treasure in it’s own right. For more information about this and other great games, please check out Cheeky Parrot Games at their site. Keep an eye out for the Kickstarter campaign launching May 17th. This entry was posted in Preview Reviews and tagged beck, beck veitch, board, board games, card, card games, cheeky, cheeky parrot games, games, hoard, julia, julia schiller, kings, lynne, parrot, schiller, tim, tim kings-lynne, veitch. Bookmark the permalink.